This page lists all of the WoW TCG Mount Loot currently available. Mounts are listed in alphabetical order. Item descriptions contain: original release date, rarity, expansion set info, and current average auction house pricing (accurate for Patch 5.4.2). The Amani Dragonhawk is an epic flyer available as a reward from the Amani Dragonhawk loot card, found in booster packs from the WoW TCG Twilight of the Dragons expansion set. This Dragonhawk mount is absolutely incredible looking - matching the appearance of the (tameable) Amani Dragonhawks in Zul'Aman. The Amani Dragonhawk is a flying mount whose speed will scale to your highest level of riding skill. This mount is obtained from The Red Bearon loot card which is part of the Drums of War Expansion Set. Unlike some other bear mounts such as the Amani Battle Bear and the White Polar Bear, this mount is a no frills, straight-ahead bear with a saddle. No goggles on this battle bear! This is a very fast mount and requires Apprentice Riding skill. This mount is obtained from the Blazing Hippogryph loot card which comes from the Wrathgate Expansion Set. This gorgeous Hippogryph not only has amazing coloring, but best of all is its flaming effect. The Blazing Hippogryph requires Apprentice Riding skill and will scale its speed to your highest level of trained Riding. As with other TCG mount loot, the Blazing Hippogryph loot item is able to be traded in game. The Corrupted Hippogryph is an epic flyer available as a reward from the Corrupted Hippogryph loot card, found in booster packs from the WoW TCG Crown of the Heavens expansion set. 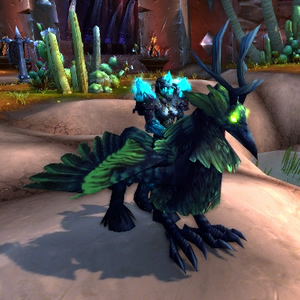 The Corrupted Hippogryph is a Fel-green flying Hippogryph mount which looks absolutely amazing in-game. The Corrupted Hippogryph is BoE so you trade or sell it in-game. This mount is very fast and will scale to your highest level of Riding skill. The Feldrake is an epic flying mount available via the Feldrake loot card, found in booster packs from the WoW TCG War of the Ancients expansion set. The Feldrake looks very similar to the Black Drake (looted from 3D Sartharion), but with some additional cool features, such as: glowing Marks of the Burning Legion above its head and on its saddle, along with luminescent claws, wings, tail and eyes. The Feldrake requires level 20 and Apprentice Riding skill in order to use. The Feldrake will scale to your highest level of flying skill. This mount is BoE, so it can be sold or traded in-game. The Ghastly Charger is an epic flying mount available via the Ghostly Charger loot card, found in booster packs from the WoW TCG Betrayal of the Guardian expansion set. The Ghastly Charger is a spectral skeletal horse, looking something like the tainted offspring of an undead horse and a Celestial Steed. This is a very nice looking mount, which also happens to be a flyer. 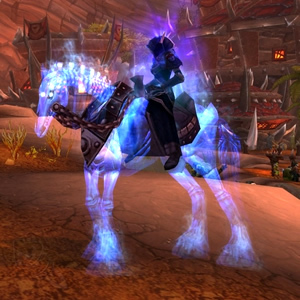 The Ghastly Charger is also the last mount loot released through the WoW TCG. The Ghostly Charger requires level 20 and Apprentice Riding skill in order to use. The Ghastly Charger will scale to your highest level of flying skill. This mount is BoE, so it can be sold or traded in-game. This mount is obtained from the El Pollo Grande loot card which is part of the Fields of Honor Expansion Set. The mount has some comical behaviors, such as cleaning its feathers and rearing its head and clucking. Its running animation is akin to that of the Looney Tunes' Roadrunner character. This is a very fast ground mount and requires Apprentice Riding skill to use. The Mottled Drake is an epic flyer available via the Mottled Drake loot card, found in booster packs from the WoW TCG Worldbreaker expansion set. 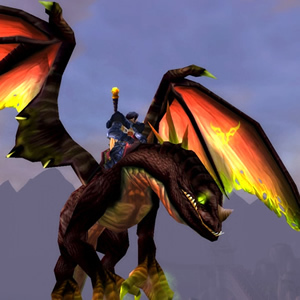 This dragon mount available through the WoW TCG bears a similar look to that of the other drake mounts, but possesses unique coloring and a mottled (i.e., blotchy or spotted) appearance. This is a very nice looking mount in-game. The Mottled Drake is a very fast flying mount and will scale to your highest level of riding skill. This mount is BoE, so it can be sold or traded in-game. This mount is obtained from the Saltwater Snapjaw loot card which is part of the Heroes of Azeroth Expansion Set. The mount travels at normal running speed, which makes it more or less a vanity item. However, Since it is a mount, items, talents and glyphs that affect mounted speed will give the Riding Turtle some extra speed. There are 2 other important items to note with the Riding Turtle...For one, it has no level requirement, which means a level 1 can use it! Second, this mount travels faster in water, so it will increase your swim speed from 60% to 100%. This mount is Bind on Pickup so you cannot trade or sell it in-game. It also has a very small chance to be contained in an Unclaimed Black Market Container. The Savage Raptor is an epic mount available via the Savage Raptor loot card, found in booster packs from the WoW TCG War of the Elements expansion set. The Savage Raptor looks nearly identical to the Red Primal Raptor, which comes from Primal Egg - a drop from the elite dinosaurs in Isle of Giants. It sort of diminishes the uniqueness of this TCG mount, but the drop rate on Primal Eggs is fairly low, and still...there is a 1/3 chance to get the red one. The Savage Raptor is a ground mount which requires Apprentice Riding skill. This mount is BoE, so it can be sold or traded in-game. The Spectral Tiger loot card was originally released as part of the Fires of Outland Expansion Set. 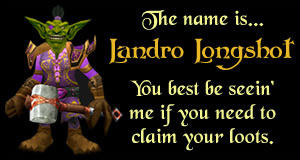 This loot card was later reissued in the WoW TCG Archives set and then again in the Reign of Fire expansion. The Spectral Tiger loot card awards players two versions of this mount -- Reins of the Spectral Tiger and Reins of the Swift Spectral Tiger. The 2 mounts are slightly different, but are equally spectacular. Visit the Spectral Tiger page to see the difference between the 2 mounts. 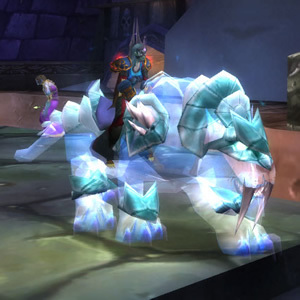 The Spectral Tiger is the most coveted mount in all of WoW, consistently selling in upwards of $500 on ebay. This mount loot is BoE, which means you can choose to keep both mounts, keep one and sell the other, or sell both of them on the auction house. The Swift Shorestrider is an epic mount available via the Wasteland Tallstrider loot card, found in booster packs from the WoW TCG Throne of the Tides expansion set. 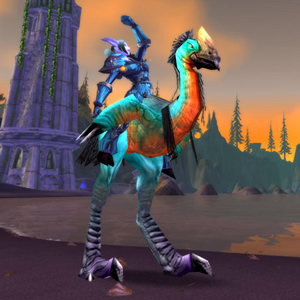 The Swift Shorestrider shares the same model as the rare Strider Clutchmother found in Darkshore, as well as the Swampstriders found in Swamp of Sorrows. This is convenient for hunters who might wish to use a matching pet when riding this mount. The Swift Shorestrider is a very fast ground mount and requires Apprentice Riding. This mount is BoE, so it can be sold or traded in-game. The White Riding Camel is an epic mount available via the White Camel loot card, found in booster packs from the WoW TCG Tomb of the Forgotten expansion set. 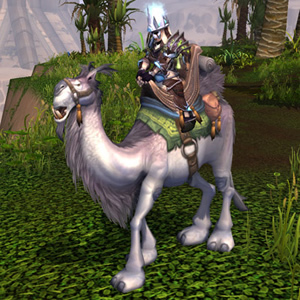 The White Riding Camel shares the same model as that of the brown, grey and tan riding camels, but is arguably the most attractive of the four camel mounts in the game. The White Riding Camel requires level 20 and Apprentice Riding skill in order to use. The White Riding Camel will scale to the highest speed of ground riding skill that your character has trained. This mount is BoE, so it can be sold or traded in-game. This mount is obtained from the Wooly White Rhino loot card which comes from the Icecrown Expansion Set. The Wooly White Rhino is a ground mount loot, and is the only rhino mount available in World of Warcraft. This beastly, enormous rhino is equipped with a saddle and ready for action. The Wooly White Rhino requires Apprentice Riding skill and is able to be traded in game. This mount is obtained from the X-51 Nether-Rocket loot card which is part of the Servants of the Betrayer Expansion Set. Just as with the Spectral Tiger, when you redeem the X-51 Nether-Rocket loot card you are granted 2 versions of the loot -- a rare version and an epic version. Both loot items are BoE so you may sell or trade them in-game. Both versions count towards the Mountain o' Mounts achievement. There are a couple of mount-type-loots available that have limited usage - either by way of a cooldown, or a set amount of charges. These are not typical mount loots that go into your journal when learned, but they do offer mount "effects". The War Party Hitching Post is a loot item from the War of the Elements Expansion Set. It's obtained via the War Party Hitching Post loot card, which isn't as rare as a typical mount loot card, but still pretty rare. When used, the War Party Hitching Post summons an "ol' west" style hitching post, along with horses for you and your party or raid to saddle up and ride. The horses require riding skill in order to use, so players need to be at least level 20 in order to ride one. The War Party Hitching Post horses will last for three minutes or until the effect is cancelled. Once summoned, there is a 30 minute cooldown before you can bring up another hitching post. War Party Hitching Post is an uncommon loot card. Tiny is obtained from the Tiny loot card which is part of the Scourgewar Expansion Set. Each loot code grants a total of 50 charges which you use to summon a ground mount - expending a charge each time you re-summon Tiny. The charges are stackable up to 250 (5 loot code turn-ins). Tiny rewards either an Alliance or Horde version, depending upon the faction of the character redeeming the loot code. Little White Stallion Bridle - The Alliance version. Little Ivory Raptor Whistle - The Horde version. The mount's speed varies depending upon riding skill, but requires a minimum character level of 20 as well as Apprentice Riding. Tiny is a very common loot card.